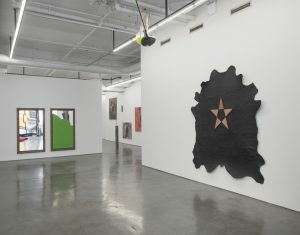 Cassina Projects is a white-walled 10th avenue gallery, steps away from Gagosian and Lisson. Its gatekeepers– the Italian sibling duo Irene and Marco Cassina– are impeccably dressed. Cassina Projects has all the trappings of a high-end Chelsea gallery, but its curatorial vision is much grander. “Daily Unfamiliar,” which opened last night, features work from Arte Povera artists including Michelangelo Pistoletto, Pino Pascali, Alberto Garutti, Maurizio Nannucci, and Gilberto Zorio. 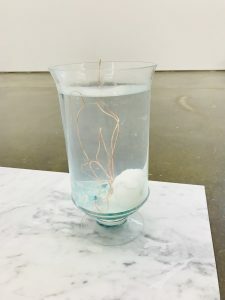 It juxtaposes their canonical works alongside contemporary Italian installations by Bruna Esposito, Antonio Fiorentino, and artist duo Parino & Vele. The Cassinas’ interest in cross-generational dialogue mirrors the transhistorical approach museums across the world are adopting in their exhibitions. Rather than focus solely on displaying and selling individual pieces, the gallerists have curated an exhibition that creates dialogue between Italian artists young and old. It is as much an intellectual museum show as it is a commercial venture. The Arte Povera artists questioned why we find some items mundane, and others, exceptional. Their work elevated the significance of ordinary objects and manipulated the energy inherent in all things. The dismantling of these associations could be disruptive– even emotional. Take Michelangelo Pistoletto’s Color and Light, for example. 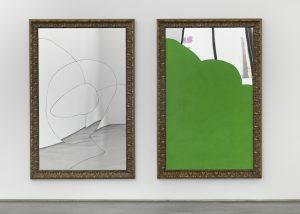 In this series, the forefather of Arte Povera performs acts of distortion on two commonplace mirrors. On one he systematically cracks the surface so that the viewer, upon looking at himself, finds himself immersed within a crooked version of reality. Lines cross the viewer’s face and body, splintering one’s self-image into a maze of displaced body parts and facial features. The destruction of the mirror triggers a disassociation with the self. If our mirror image is a reflection of who we are, then what does this distorted reflection say about our identities? It is an emotional experience to question who you are, and Pistoletto, who is now 84, captures this sentiment profoundly. The masterful artist obscures part of the second mirror with fabric, preventing the viewer from examining himself. The fabric stops just short of the mirror’s top-right corner, allowing us a glimpse of a reflective surface just out of our reach. It is a tantalizing reminder that our desire to admire and critique ourselves– to engage in an affirmation of the self– is just inches away. By taking away our ability to self-examine, Pistoletto reminds us just how much we want to. These two experiments demonstrate Pistoletto’s return to the mirror paintings that made him famous in the 1960s. He has always been fascinated by “the virtual space generated by the reflecting surface.” Color and Light suggests that this space is emotionally charged and deeply individual to each viewer. To read more about Pistoletto’s mirror paintings, check out his website. The artist Bruna Esposito was born almost thirty years later, and was surely influenced by Pistoletto’s emotional explorations of space. 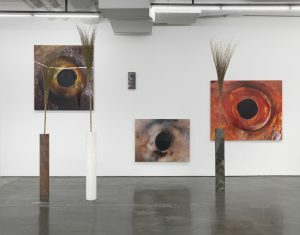 Her “Daily Unfamiliar” installation includes a series of photographs entitled Occhi and an untitled group of sculptures crafted from marble and broom. I am particularly drawn to Esposito’s photographs. Like Pistoletto’s mirrors, they seem to contain an extra layer of space, though here I find the plane to be behind the work. Look deeply into the black holes captured on film and you might feel as if you’re tipping into a cavern devoid of gravity and light. It is strange, then, to learn that these black holes are actually high-resolution images of fish eyes. Like her predecessors, Esposito magnifies the significance of seemingly insignificant objects. With Occhi, Esposito has pinpointed an uncanniness in an otherwise commonplace creature. She sees in its eyes a physical and emotional space that we don’t understand, but that we feel to be tangible. The artist also understands the creature’s hidden power over us. 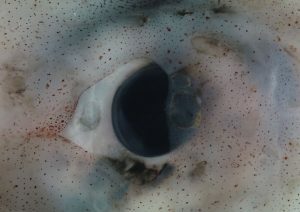 We are peered at from all angles by an aquatic ‘Big Brother’ with gelatinous skin. We feel his eyes on us, but we cannot quite look back at him– there is no pupil to connect with emotionally. When we try, we find ourselves on the edge of a precipice, slipping into a world without light. Gilberto Zorio, another titan of Arte Povera, is famous for his experiments in alchemy and his preoccupation with energy. Since the 1960s the artist has explored the use of energy in art through chemical reactions and heavily-charged symbols. Stella, made in 2000, features both. The work incorporates black leather, oxidized copper, iron, and fluorescein. Zolio utilized processes such as dissolution, evaporation, and oxidation to manipulate these varied materials. The physical energy harnessed by these chemical reactions is amplified by the shapes Zolio adopts. The 5-pointed star bears a multiplicity of meanings, from cosmic warfare to the human microcosm to the underworld. What these associations have in common is scale. The 5-pointed star, no matter how tinily drawn or sculpted, represents the energy of the heavens, mankind, and the afterlife. Its shape has the power to harness boundless energy. It is the perfect vessel through which Zolio can capture and transfer energy in his artwork. But the star is no longer pristine. A thin shade of darker brown muddies its surface, aging it. What if Stella not only looks old, but is old? What if Zolio performed chemical processes on the metal to harness the primordial energy of the universe? I would believe it. The symmetry and symbolism of the work feel primitively powerful– we feel its strength rather than consciously accept it. 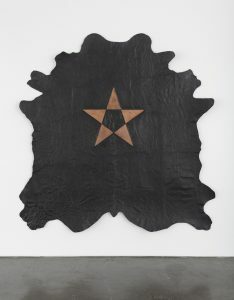 The star also sits on a black leather animal hyde. What massive, prehistoric beast did this hide belong to? Did Zolio summon its essence through his chemical manipulations? These are the questions that Zolio poses, but will never answer. He has taken the simplest symbols and imbued them with the greatest power in the universe. What is more Arte Povera than that? Not too much. But contemporary artist Antonio Fiorentino is proving himself the able heir to the alchemist’s throne. He is interested in the substances that make up our world, and how these compounds can be controlled or liberated. 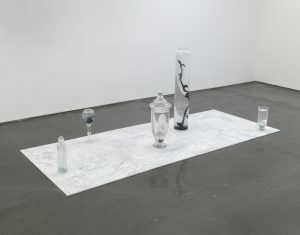 His 2018 installation for “Daily Unfamiliar,” Opusimago [The Glass Elements] utilizes chemistry to bring attention to matter. The artist first built a slab of marble tiles, a process that required extreme precision. Atop the marble he situated vitrines filled with carefully chosen chemical reagents. Fiorentino, who is skilled in chemistry, designed the chemical reactions for each vial in order to achieve certain aesthetic effects. However, the artist acknowledges the element of chance in these chemical reactions. He also notes that the reactions are not static. As time passes, the contents of each vial will slowly shift, forming new amorphous shapes. And so, Fiorentino has substantially less control over this aspect of the work. The artist is fascinated by the juxtaposition of control and release, and has paired the two brilliantly in Opusimago. I find many conceptual similarities between Zolio and Fiorentino’s work, despite their aesthetic differences. 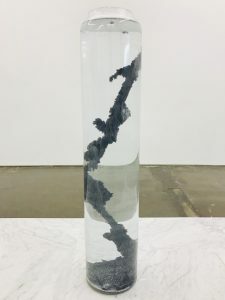 Zolio’s chemical reactions summon primordial energy to his ‘canvas.’ Fiorentino’s chemical manipulations are also motivated by an interest in energy and matter, but his creationism feels futuristic rather than prehistoric. His alchemic experiments take existing matter and transform it into new forms, whose tentacle-like bodies suggest sentience. In such a way he situates himself alongside his predecessors, utilizing his skills to give old objects new meaning, and in some cases, new life. These dialogues are just two of many cross-generational relationships formed in “Daily Unfamiliar.” Irene and Marco Cassina are exhibiting equally thought-provoking work by Pino Pascali, Alberto Garutti, Maurizio Nannucci, and artist duo Parino & Vele that bears mention and equally close examination. “Daily Unfamiliar” will run through July 27th– the length of the exhibition is yet another reason that Cassina Projects reminds me of a small museum. I wish more gallerists approached their curation as intellectually as the Cassinas do. 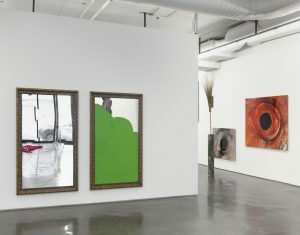 Contextualizing the exhibited work elevates its cultural importance, situating the artists within the art historical canon. The Arte Povera movement and its descendants will go down in the history of conceptual art. Take the opportunity to see them exhibit together now.